Update 2018: wanna make these ribs in your Instant Pot? These ribs are one of many 36 recipes in my new Instant Pot for Beginners eBook! Click below to get your copy! 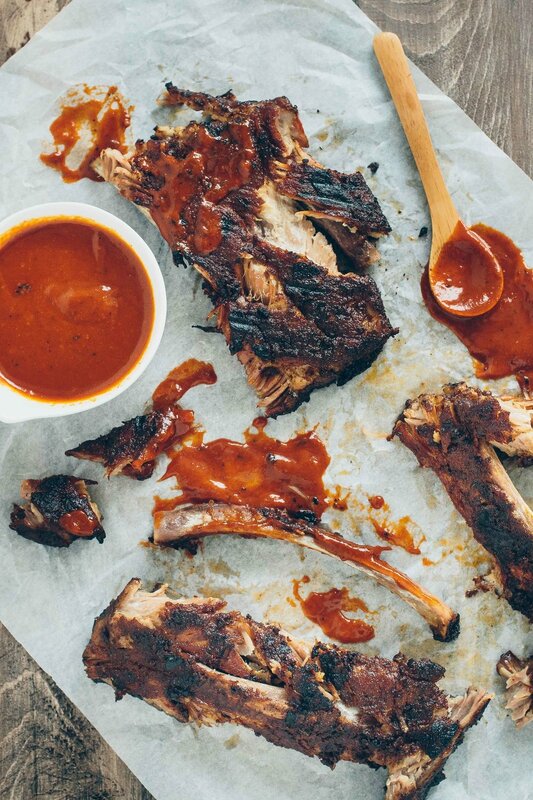 For anyone planning ribs for your BBQ today, I’ve got a killer rib rub and sauce recipe for you! I am obsessed with sweet BBQ sauces so I’ve been working to perfect a knock-off of one we get at the store occasionally. It’s not too sweet, just a little tangy, and it has a really deep smoky flavor. Of course, they don’t taste exactly alike but pretty close. And if anything (like usual), you get a better depth of flavor when you go homemade. We have ribs A LOT. They are fairly affordable and a really nice change from the regular chicken dinner. I’ve started to gravitate toward spare ribs, rather than baby back. Spare ribs (often labeled st. louis style) are from the belly of the pig, whereas baby back are from the backside. Just like we know of bacon, etc, cuts from the belly are fattier. So this makes spare ribs that much more flavorful and in my experience, the fat helps them cook down a bit quicker. Baby back have less fat but more meat so you usually need a little more time to cook due to the ratio of meat to overall weight of the ribs. I’ve also found that the pastured spare ribs at our market run almost half the cost of the baby back. And as those of you on a paleo-style diet know, you’ve got to get savings on your protein where you can. When first venturing into ribs, I relied on just salt and pepper. It’s not bad, actually delicious if you don’t have anything to compare to. But when you get a perfectly balanced rub on the ribs and let it marinate a bit (even an hour or two is enough), there’s just no comparison. 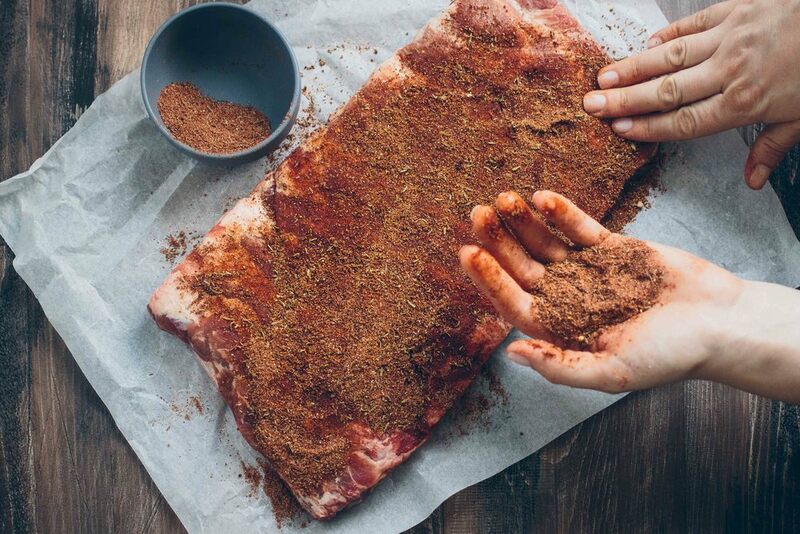 Rather than relying on a sauce to flavor your meat, a rub gives you flavor *throughout* the meat. And you need WAY less sauce to dip in. This is a win for me since I should probably not be eating a half gallon of sweet BBQ sauce every time I enjoy ribs. There are quite a few ingredients in most rub recipes. I tried to keep it simple with the most crucial spices for good flavor. And if anything, this is a challenge from me to you to bulk up your pantry. Having a well-stocked spice cabinet will encourage you to make more things homemade. You’ll also be more satisfied with the results if you can easily build complex flavors with varied spices and herbs that you have on hand! P.S. These ribs & sauce go great over top of a hearty mash. We had them over top this Celery Root & Turnip Vegetable Mash and it was stellar. To prepare the rub: whisk all the spices together. Reserve 2 tablespoons of the rub if making the BBQ Sauce shown below. 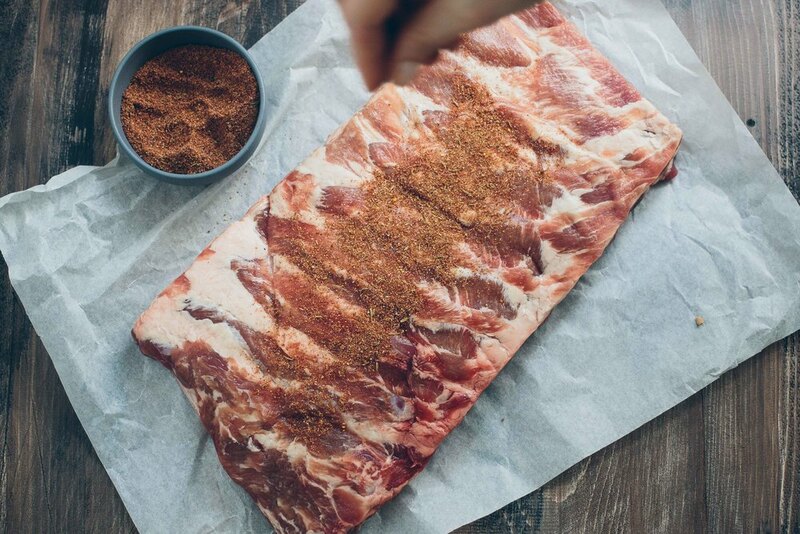 Use the rest of the rub to heavily coat the ribs on both sides. Press it into the meat well. It’ll get sticky but make sure it’s well-coated. 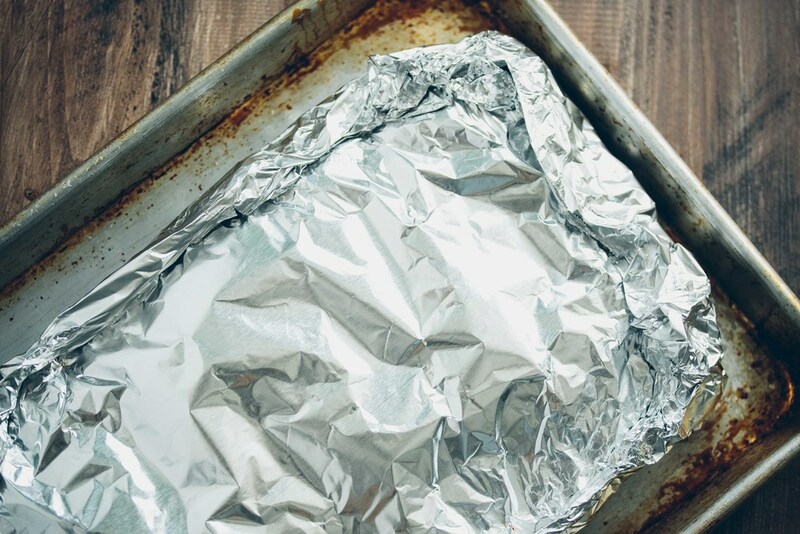 Wrap the ribs in tinfoil and seal the edges tightly. Place the wrapped ribs on a baking sheet and move them to the refrigerator for 12-24 hours to marinate (this can be as short as 1-2 hours if that’s all the time you have). To cook: preheat the oven to 250F. Bake the ribs for 2.5-3 hours, or until the meat falls off the bone and shreds easily. They are ready to eat at this point but I highly recommend a final sear on a grill for those charry bits (we use this simple one for home and camping) or on an indoor grill pan or cast iron skillet. Grill on high heat until browned, about 3 minutes per side. Combine all the ingredients in a medium saucepan. Whisk well. Bring to a simmer over medium heat, whisking occasionally. Turn the heat to medium-low and simmer for 10-15 minutes, or until it has thickened slightly. Remove from the heat and use an immersion blender or regular blender (use caution when blending hot liquids) to puree until smooth. Serve with the ribs and store any extras in the fridge for up to 2 weeks. If using a store-bought BBQ seasoning, omit the listed sea salt and pepper and taste at the end to gauge if it needs it. I don’t recommend replacing the tapioca with arrowroot, as it doesn’t hold up & thicken under extended heating like tapioca does.